Watson Ranch Organic Soil Amendments Affordable alternative to Chemical Fertilizers!! The local weatherman announced that Laredo had received so little rainfall thus far this year that the only worse record dated all the way back to 1873! I normally log 26" of rain per year, but have only gotten 6.04" as of the date of this email, with 1.15" of that falling the last 3 days. Most of the local ranchers have culled their herds to the bone: one of my neighbors who ranches 1,600 acres told me he is running 12 cows and 1 bull. When they can be found, round bales cost in excess of $100/bale. Since June of 2017, I have been applying Watson Ranch Kelp, Fish Hydrolsate and Molasses by injecting small amounts of the premixed products into my irrigation system. I usually add 25 gallons to 1500 gallons of water in a nurse tank and inject it at a very low rate. That amount will last about 10 days or so and will be applied to my pastures at a rate of 1.25" of moisture per a 24 hour period. I won't apply water/fertilizer to that same grass for 14 to 20 days on rotation. I have NOT reduced my herd by one cow as a result of this drought. I have purchased no hay and only enough cake to move the cattle. I have enough forage to intensively graze my pastures in small blocks and can let the grass rest at least 90 days before cattle will be on that same block. The results have been outstanding! 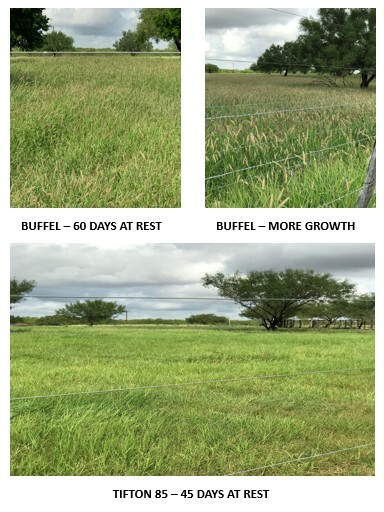 Below are photos indicating the results of using your Watson Ranch Organic Fertilizer.